I want to tell you all about this easy chinese chilli chicken dry but before that, I also want to tell you all about the last few days because I’ve been home in Raipur. And like every other trip to Raipur, it’s been the best time ever! We’ve been busy celebrating Diwali and just hanging out with the family. And I’ve been meaning to make this chinese chilli chicken dry because you know, we are crazy about Indian street chinese. Which is only possible at a stall, the shady kinds, where you’ll park the car, sit in the car and order in piles of food on trays and juggle it around inside the car. You know the kinds right? We’ve all done those haunts and honestly, I think they have the best kind of food. Nothing fancy, just straight up great indo chinese. I don’t claim that this is anything close to an authentic chinese chilli chicken. Actually I’m not sure if anything like that even exists. But we understand right? Our love for delicious things which are a product of a street experiment that you keep going back for. This indo chinese chilli chicken dry took some time to perfect because they have a lot going for them, a wok, high heat, all those smells and tastes. But I know how much all of you will want to make this at home as soon as you can. I don’t mind. It just meant trying out chilli chicken dry every other day, but we are the boss of chilli chicken dry now. Which is never a bad thing. You can totally make this with more gravy if you like chilli chicken gravy, but we sort of like the dry version on most days. Unless it’s really chilly and then I want more chilli chicken gravy than rice because I can almost have it like soup with the rice all soaked into the bowl. In fact right now I’m dying to make it for my dad, because we demand chilli chicken dry every time we come down to Raipur. But I haven’t had a chance yet. And tomorrow we are heading to a wildlife sanctuary for a couple of days – just the five of us to have a little ‘us’ time. We’ve actually started planning these short trips every time we come to Raipur now, because that’s the only way we can travel. And it’s soooo much fun! 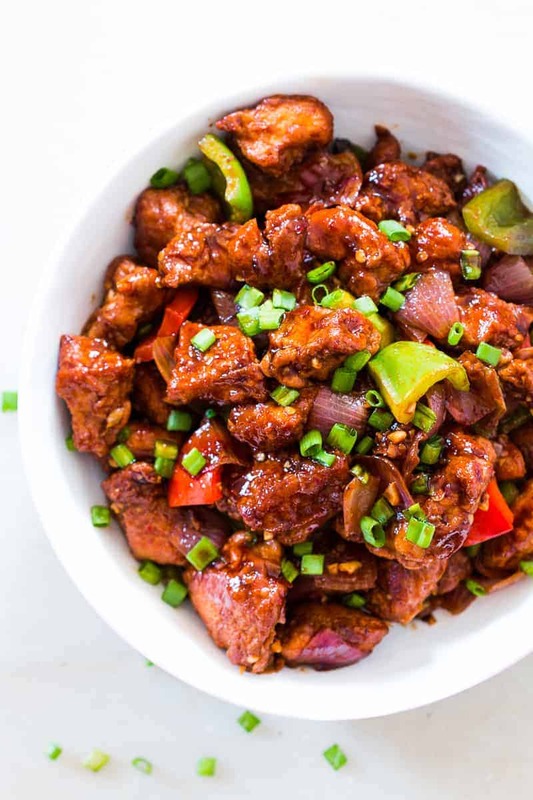 Back to this chilli chicken dry with just enough sauce to coat the pieces and lots of green chillies, capsicum and onion to give you that perfect street style chinese flavour! Guys this is one of those recipes that is made soooo often now that we are in chilli chicken heaven! If you try it out, don’t forget to tell me all about it! 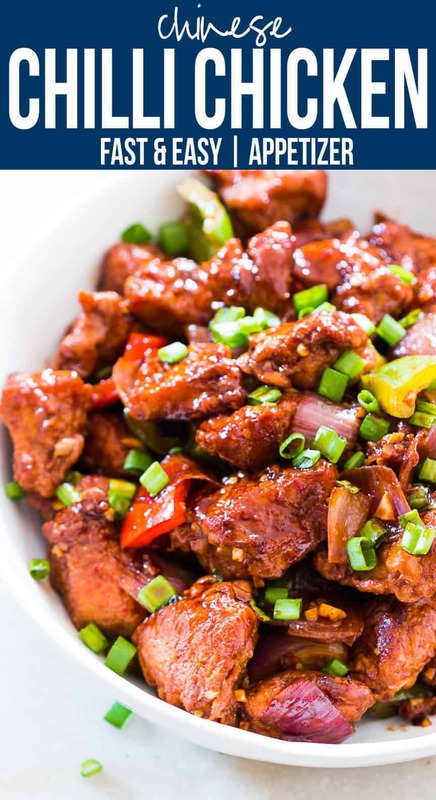 Easy recipe for Indian Chinese Chilli Chicken Dry. 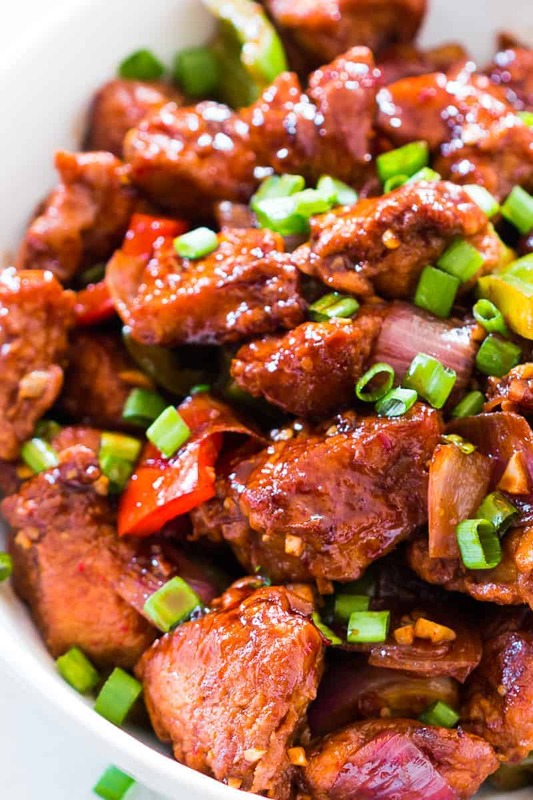 This will give you fool proof restaurant style chinese chilli chicken dry every time! It’s sweet and sour, crispy and spicy. You can also make it with gravy, but dry is our favourite. In a large bowl mix together all the ingredients listed under marinade (flour, cornflour, ginger garlic paste, soy sauce, chilli sauce, chilli powder, pepper powder and egg) and add chicken. Set aside for 15 minutes to an hour. Heat oil for deep frying in a deep pan or kadhai. Once the oil is hot enough, start adding the chicken pieces and deep fry for 5-8 minutes till golden brown. 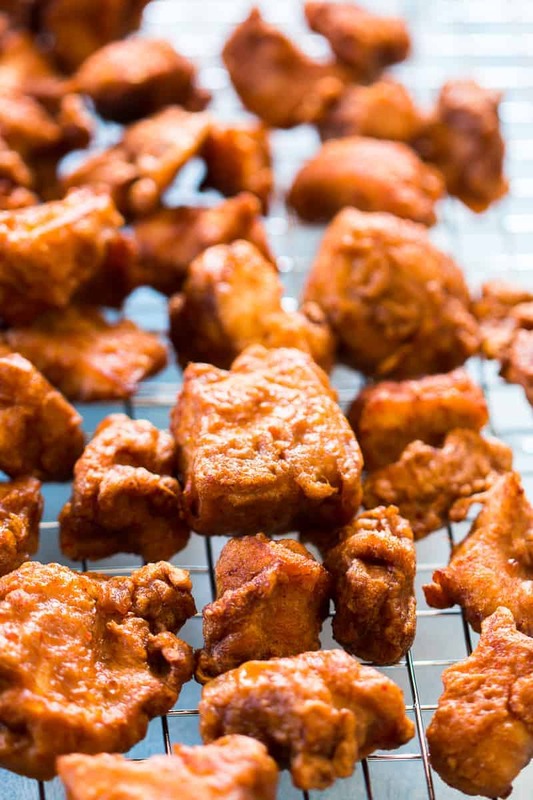 Take the chicken pieces out on a tray lined with tissue to absorb any extra oil and set aside. In another wok or kadhai, heat one and a half tablespoons oil and add green chillies, ginger and garlic. Saute for a minute or so and add the cubed onions. Stir fry on high heat for 2-3 minutes and add the white part of the spring onions, reserving the green parts for sprinkling on top later. Cook the spring onions for a quick minute and add the capsicum and fried chicken. Toss together and cover and cook on medium flame for 2 minutes. In the meanwhile, whisk together all the ingredients for the sauce (soy sauce, chilli sauce, tomato ketchup, chilli powder and vinegar) with 2 tablespoons water. Add the sauces to the chicken on high heat and toss well till the sauce coats the chicken. Toss everything for a minute or two and switch off the flame. Top with the green part of the spring onions and serve immediately! 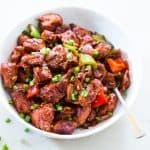 Best ever chili chicken recipe I was looking and craving for years. Not just my family, but also my extended family loves it. Delicious!!! How can I make chilli chicken with gravy? can i make the chicken with milk? Hello. I’ve made this before and everyone loved it, most especially my hubby. Thanks so much! One question, I want to make it with more gravy this time. How can I do that? Hey Gordafreed, so glad your family liked this! To make more gravy, increase the amount of water in the last step to a cup and add 1 teaspoon cornflour to the mixture. The water will increase the liquid and the cornflour will help thicken the sauce. Came out really yummy, gave a good surprise to wife.. thanks a lot. Awesome! Love a husband who cooks for his wife! Really? Then you can just taste and add some. We didn’t feel the need for any extra salt because all the sauces already have salt in them. Hi Richa, just a quick question. Can I marinade the chicken overnight and keep it in the fridge? What is pepper powder? What kind of chili powder? Pepper powder is basically ground pepper. You can use paprika instead of chili powder. Chili powder is usually made with ground red chillies. Hi, I just stumbled onto your site. and like what i see. I would like to make this recipe, but need some clarifications on some of the ingredients. I live in the states and don’t know if we have the same ingredients here that you are using. our chili powder contains cumin, paprika, chili powder,oregano. is this the chilli powder you are using? Or is it a single chile in powdered form that you are using? If so, what kind? also,you use chilli sauce. we do have a chilli garlic sauce. would this work? and you call for a capsicum. There are so many different ones here. but in your photo it looks like a red bell pepper cut into large chunks. is that what you used?I would like to make this as authentic as possible. I hope you can help. Thank you for sharing. Hey Theresa, I’m sorry it took me a while to get back to you. Let me clarify – the chili powder we get in India comes from a single chili (if you really want to try it, its easily available at an Indian store but be warned – it can be quite hot). You can use paprika instead of chili powder. The chilli sauce is just a generic spicy chinese sauce so you can use Sriracha instead. And as for capsicum, I like a combination of red and green bell peppers here. I hope this answers all your queries. Is there any substitute to egg used in the marinade for chicken? Hey Shalini, egg is the best way to create this marinade as it lends a crispy coating and also adds moisture. But you can try water or broth instead. Is there a way I can make it without frying??? Not really, you can try baking it but it wouldn’t get as crisp and the cornflour will remain mushy. Ooooh Chilli Chicken is all of that for me! Thanks Anindya, Chilli Chicken is the same everywhere in India I think except the Military Hotels in Bangalore where I’ve had a really spicy Green Chilli Chicken 🙂 It’s one of my favourites! The one with hell lotsa green chillies right?